Gooseberry? Who ever heard of a Gooseberry? At GoFresh, we can get all sorts of interesting produce from all around the world. Most recently the happy surprise was Gooseberries. I remember hearing about gooseberries, maybe from a childhood storybook, but I did not realize that they were real. They sound like something from Willy Wonka and the Chocolate Factory to me. Now that we both have, let’s learn some more reality than just pure imagination. Why do they call them gooseberries? If their leaves were goose feather like soft, that would be neat but I doubt that is the case. Wikipedia suggest that it could be because the French word for “gooseberry is groseille à maquereau translated as ‘mackerel berries’, due to their use in a sauce for mackerel in old French cuisine.” Who knew that these berries were so fancy! Where did these berries come from? Where are they grown? The writers at Food Facts say that the “small and firm but sometimes ribbed and translucent, gooseberries are a unique little plant-based food growing on relatively small, thorny bushes. Although their history is rooted in Europe, gooseberries were cultivated in Asia and Africa before the British began developing new varieties in at least the sixteenth century. 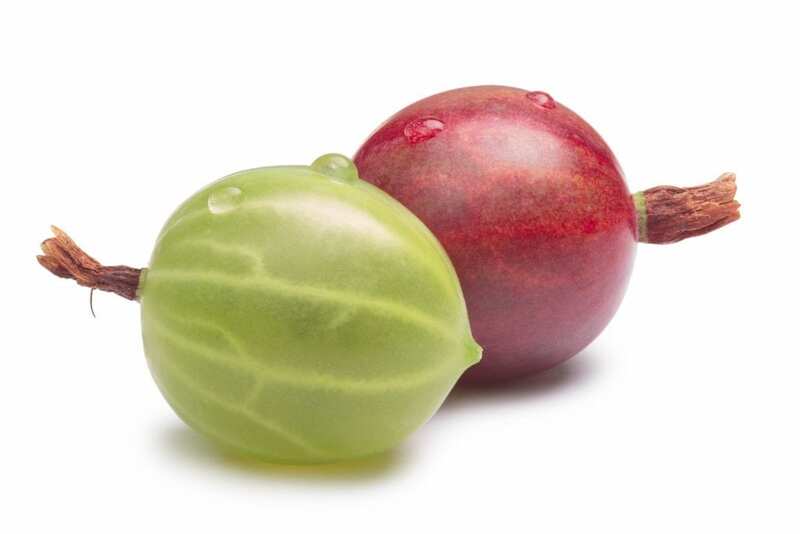 There are now around 2,000 cultivars and two main gooseberry types: American and European (Ribes uva-crispa), which are larger and said to be tastier. They’re from the same botanical family as currants, and grow wild and prolific in places like North America and Siberia. Interestingly, this one berry comes in varying shades of yellow, green, red, or black, and can be round, oval, pear-shaped, or elongated. There can be tart and sweet berries on one bush, each containing a plethora of miniscule, edible seeds. Gooseberries thrive in changing seasons involving frigid winters and humid summers, and they’re more shade-tolerant than other fruits. The Indian gooseberry (Emblica officinalis, or amla) is light green and extremely bitter. The Cape gooseberry – sometimes called a Peruvian cherry – is yellow-orange and surrounded by a paper-thin husk that falls off as it dries. In the U.S., fresh gooseberries are usually ripe for the picking around July; red berries are generally sweeter.” YES! Just in time for summer pies. YUM! I also learned that gooseberries have almost 20 times the vitamin C that is contained in oranges and don’t lose any of it in the cooking process. Thanks Food Facts! I know that I can eat them raw but what else can I do with gooseberries? Susan Chen from PopSugar.com gives these pointers. -Pair gooseberries with our berry du jour, blueberries, to make a fine jam. -Fashion a creamy, sour curd with under-ripe green gooseberries instead of lemons. -If you’ve had enough of blueberry pie, then make a gooseberry adaptation instead. -Prepare the gooseberry fool, a classic English whipped cream dessert. From what has been mentioned, here are some other recipes we both can try as we experiment with this new fun berry, that is slightly fuzzy, but does not honk.